The blue economy in Africa is neglected, ignored or underexploited, but it can offer a range of African solutions to African economic problems. More than one-quarter of Africa’s population lives within 100km of the coast and derive their livelihoods there. According to the International Energy Agency (IEA), by 2020, the annual economic value of energy activities related to maritime affairs will reach EUR 2.5bn.1 Out of the 54 African countries, 34 are coastal countries and over 90% of African exports and imports are transported by sea. The territorial waters under African jurisdiction cover a surface area of 13 million km², with a continental shelf of some 6.5 million km² comprising exclusive economic zones (EEZ). The continent covers 17% of the world’s surface water resources. The strategic dimension of the blue economy is an indisputable reality for African countries. It is for this reason that it has been included in the African Union’s Agenda 2063 and that a practical handbook on the blue economy was prepared by the United Nations Economic Commission for Africa in March 2016. 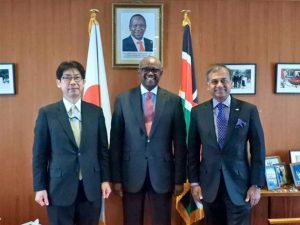 Kenya co-hosted the Sustainable Blue Economy Conference (SBEC) between the 26th and 28th November 2018 with Canada and Japan.3 SBEC aimed to make progress towards safeguarding and developing the world’s water bodies and the ecosystems that live therein. The conference hosted over 17,000 participants from 184 countries and sought to exploit the potential of oceans, seas, rivers, lakes by leveraging on the latest scientific knowledge and innovation while ensuring the proper conservation of the aquatic resources for generations to come. During the conference, President of Kenya Mr. Uhuru Kenyatta made several pledges including enhancing security in the high seas, combating illegal fishing while supporting sustainable and responsible fishing of endangered species and key fish stocks, among other things. Japan’s support to the Blue economy will ensure that the Blue/ocean economy, will be “a major contributor to continental transformation and growth” as envisaged in the Agenda 2063, Furthermore the sector will benefit from Japanese expertise in maritime security and safety. Japan has proven expertise and demonstrated real contributions in ensuring freedom and safety of navigation, as witnessed by Japanese contributions to improving navigation safety in the Straits of Malacca. i. Most African states are looking seaward for alternative non-conventional renewable sources of energy. There’s interest in offshore solar power as having high potential as a major source of energy. Japan private sector can help here. Japan’s largest solar power plant, the Kyocera Corporation’s Kagoshima Nanatsujima Mega Solar Power Plant, is an offshore technology built on reclaimed land jutting the waters of Kagoshima Bay, generating 70 MW of energy in Kagoshima City. The project has an annual power generation capacity of 78,800MWh and is expected to supply clean electricity to approximately 22,000 average households. ii. While there’s been no commercial developments to date there’s still international interest in deep-sea mining in the Indian Ocean. For polymetallic nodules, Japan is a pioneer investor in the Indian Ocean and the International Seabed Authority entered into contract with Japan after the Law of the Sea Convention came into effect. Japan can help with mining technology, processing technology and environmental impact assessment. There’s also growing interest in developments in relation to deep water gas hydrates energy reserves (reservoirs of gas trapped in ice crystals) where Japan is at the cutting edge. India and Japan last year carried out a joint survey for gas hydrates using a Japanese drilling ship in the Indian Ocean. Japan has set itself the target of bringing methane hydrates into the mainstream by the early 2020s. Prime Minister Modi has listed work on gas hydrates among the top 10 potential areas of research for India. iii. R&D in marine biotechnology is emerging as a promising sector for growth and employment in the Indian Ocean. The Indian Ocean region is rich in marine biodiversity: we’re likely to see the realisation of marine biotechnology potential, including the culture of a range of marine organisms for biofuels, bioremediation and bioproducts. iv. Aquaculture is a key driver of the Blue Economy in the Indian Ocean providing food, nutrition and employment opportunities to the people in the region. Since capture fisheries face the problem of overfishing in the region, the challenges of food security can be addressed through aquaculture production. Aquaculture has the potential to transform the global food system for the better. Japan has tremendous skills in this industry and can assist African states in developing aquaculture systems that expand the range of foods and the nutritional content of those foods, while ensuring that the industry is economically and environmentally sustainable. v.	Japan can strengthen the digital blue economy in the Indian Ocean: the undersea cables and the electronic services that they can enable, such as broadband and data exchange. Japan can contribute to the growing digital fabric connecting the Indian Ocean: it’s got some of world’s top vendors of submarine cable systems. UNDP is the longest serving co-organizer of TICAD process with the Government of Japan. Co-organizing TICAD process provides Japan and UNDP with important strategic advantages, including: (1) facilitating global discourse on Africa’s development; (2) promoting innovative partnerships; (3) Enhancing integration of the UN Development System; and (4) Enhancing strategic partnerships with Japan in Africa as the key driver of the corporate strategic partnership with Japan. In addition to the issues raised above, we expect TICAD 7 to promote Africa’s blue/ocean economy to enhance sustainable use of marine resources, developing port facilities and facilitating marine transport. Furthermore we expect the issue of Africa’s infrastructure and connectivity to be high on the TICAD 7 Agenda as this will unlock the construction and management of quality transport infrastructure, such as ports, maritime corridors, airports, railroads, bridges and trunk roads that are efficient in view of life-cycle cost, reliable, safe, resilient against natural disasters and environmentally friendly, to strengthen connectivity in Africa, utilizing state of the art infrastructure technology. In line with SDG 14, development of this sector must also promote social inclusion while ensuring environmental sustainability. In this respect, the continent owes special consideration to people living along the shores of oceans, lakes and rivers, essentially youth and women. The question of how this new frontier can address poverty reduction and hunger when leaving no one behind must be a central consideration. We need to be able to govern resources effectively and be able to utilise them in a way that’s transparent and inclusive. The African Union has launched its 2050 Integrated Maritime Strategy in a bid to provide a broad framework for the protection and sustainable exploitation of Africa’s marine resources. At its heart lies the creation of a Combined Exclusive Maritime Zone of Africa (CEMZA), a common maritime space intended to boost trade, protect the environment and fisheries, share information and boost border protection and defence activities.